Coming from unknown high school and club programs, the Cerritos, Calif. native was unsure how he would stack up against athletes who had played for top club and national teams. Now entering his senior year in the pool, the story has flipped, and, by season’s end, Mojica, who is now a team captain, is positioned to leave the team as one of the best players in program history. Mojica enters the year ranked second all-time with 147 career assists, just 11 assists shy of becoming the program’s all-time assist leader, a title that now belongs to alumnus David Zenk. Mojica also began the year ranking third all-time with 40 career field blocks. Mojica comes off last season leading the team in assists (48) and was third in total points (72). His skills and presence in the locker room give head coach Scott Reed a leader he can look to in the huddle. Mojica is ranked second all-time with 147 career assists, just 11 assists shy of the program record. Before taking to the pool for a match, Mojica’s comes up with ways to stay relaxed and focused. Starting his sophomore season, both he and senior Adam Wrobel performed a yoga routine during pregame. Growing up, Mojica said he had never planned to be a water polo player. He chose to play soccer as a kid, but after an injury kept him from running and forced him off the pitch in the sixth grade, his parents decided to place him in a swimming program. He soon grew bored with swimming, though he noticed other kids playing water polo. With some encouragement from his brother and cousins, who all played the sport, Mojica tried it out. As he progressed through middle and high school, Mojica fell in love with the game. He gave up other sports, such as basketball and baseball, and began to excel as a water polo player. With offers from Fordham and GW on the table, Mojica said it was an easy choice. Mojica joined a team that featured no seniors. He said the lack of upperclassmen increased his work ethic, pushing him to become a team leader over the past three years. Beyond his vision for the open play in the pool, Mojica stands out for his ability to make his teammates laugh. Mojica, known for his bright personality, said he wants to be the guy who keeps up the team’s morale as the grind of the regular season takes its toll. But the laughter and fun do not end when Mojica and his teammates step out of the Smith Center natatorium. 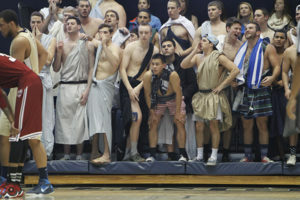 The water polo team frequents the GW grandstands, and any student can see Mojica’s character on display at various sporting events, most notably men’s basketball games. Brian Mojica and the rest of the Water Polo team frequent the sidelines of GW sporting events to cheer on fellow athletes. Water polo’s school spirit picked up during Mojica’s sophomore season, when the team went to a basketball game dressed in holiday sweaters. The group has also donned beach wear and togas. They are often the loudest and many times the most comical fans at games. Watching the volleyball team’s home opener against Auburn on Aug. 29, Mojica and his teammates started to belt out Bruce Channel’s “Hey! Baby,” trying to distract one of the Auburn players. Although Mojica is entering his final season playing collegiate water polo, he said he has no plans to give up the sport he accidentally fell in love with. Mojica is aiming to earn a spot on the Philippine national team, a longtime dream of his. He is already in contact with the team’s captain, and he hopes to visit the squad during winter break.